The following statement was co-authored by the Palestinian Youth Movement, the daughters of the Holy Land Five, and the Coalition for Civil Freedoms on the 10th year anniversary of the Holy Land Five’s unjust convictions. Below the statement is our call to action. It is republished here from the PYM website; Samidoun is an endorser of this important statement and call to action. Ten years ago today, five Palestinian-Americans who were pillars of their communities were convicted on false charges of “providing material support for terrorism.” They ran the largest Muslim charity in the United States, the Holy Land Foundation for Relief and Development (HLF). As George W. Bush waged the domestic “War on Terror,” in December 2001, he designated the HLF as a “terrorist” organization, stating that the government would seize their assets and close them down. The U.S. government acknowledged that all financial support HLF sent to Palestine went to charities that support widows and orphans living under Israeli occupation, and were the same ones that the U.S. government itself sent money to. Not a single dollar was used for any violent activities, yet five key members of the HLF—Shukri Abu Baker, Ghassan Elashi, Mohammed El-Mezain, Mufid Abdulqader, and Abdulrahman Odeh, known as the Holy Land Foundation 5 (HLF5)—were unjustly convicted in 2008. The HLF trial is considered the largest “terrorism” financing case in U.S. history, and yet prosecutors did not argue that the charity or any of its officials funded any violence. Instead, they told jurors that the schools, hospitals, and social welfare programs the charity sent money to were under Hamas’ control. Since money is “fungible,” prosecutors argued that those donations freed up other funds for Hamas to use in violent attacks. The irony is that these same Palestinian charities also received donations from the U.S. Agency for International Development (USAID), which is funded by the U.S. government and the International Red Cross. After failing to convict them in the first trial, the case was retried. It featured the testimony of an anonymous Israeli intelligence agent whom the defense team was unable to adequately question— the first time in legal history that a court had allowed an expert witness to testify under anonymity. An outfit run by notorious Islamophobe, Steven Emerson, the Investigative Project on Terrorism, supplied fabricated testimony central to the criminalization and indictment of the HLF5. They were given sentences of up to 65 years in prison, and were put in Communication Management Units (CMUs), often dubbed the “Gitmo North” due to the severity and discriminatory nature of their conditions. The closure of the HLF and the conviction of its five most prominent members was meant to have a chilling effect on the Muslim and Arab communities in this country and to hinder their ability to mobilize around social justice issues, such as Palestinian self-determination. The case was one of the most egregious attempts by the government to stretch the definition of “material support for terrorism,” going as far as vilifying legitimate charitable works. This strategy is part of a long tradition of the U.S. government using incarceration to criminalize black and immigrant communities and to silence political activism and dissent. Today, we continue to honor the HLF5, to fight for justice on their behalf, and on behalf of the other political prisoners that languish in the U.S. prison system as an attempt to intimidate and further marginalize our communities. We affirm that the only reason the HLF5 were targeted by the U.S. government is because their mission was explicitly rooted in community empowerment and worked to alleviate the conditions caused by Israeli settler-colonialism in Palestine. We stand by the HLF5, their families and their communities, and salute their struggle in their firm resistance against Zionist repression and aggression in all its forms. 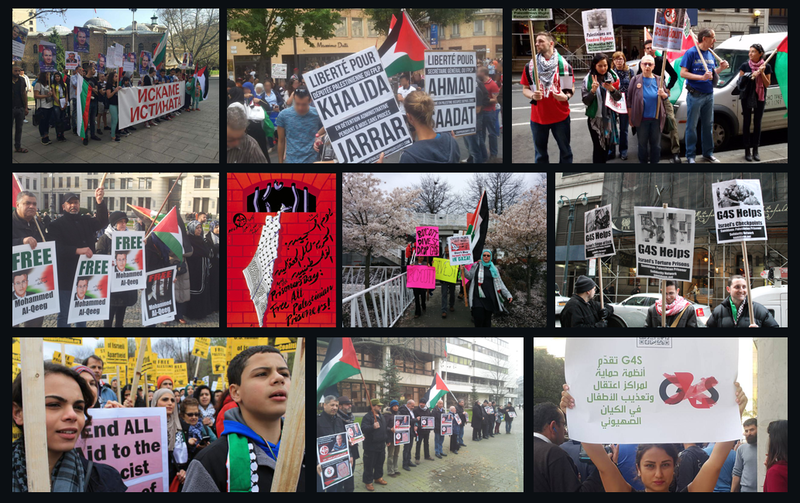 We stand by their work and will continue to build institutions that serve our community as part of our larger commitment to the Palestinian national liberation movement.